Niki no Kashi maybe one of Ameyoko’s most famous vendors. In business since 1947, Niki no Kashi is a large discount shop for sweets and candies. Part of the attraction is the unusually large selection of dagashi. Dagashi are affordable snacks and sweets, popularized in the Showa period. There are a few shops around the city that still sell dagashi, often each piece selling for about 10 yen each. You often hear fellow shoppers in the dagashi section saying things like “natuskashii”, meaning that this reminds them of the old days. Part of their selection includes European chocolates, Japanese chocolates, sembei, wagashi, snacks, karintou, and mamegashi (bean sweets). 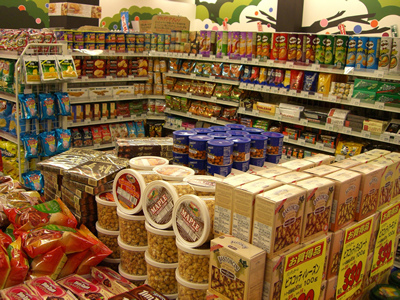 There are chips and snacks, both Japanese and imported, as well as packaged foods including pickles, curries, and spices.